From mid-November I will have 6 paintings on show at The Cass Business School, Northampton Square, London EC1V 0HB. The paintings will be displayed for 6 months and will be available for purchase. I am a big fan of David Hockney and loved this recent BBC interview with him. He hits the nail on the head when he talks about how we really look at the world. For more information keep an eye on the Cambridge Christmas 11 website. I have been away for the last few weeks visiting Lazio and Umbria. During my travels I made a special trip to see one of my favourite paintings. 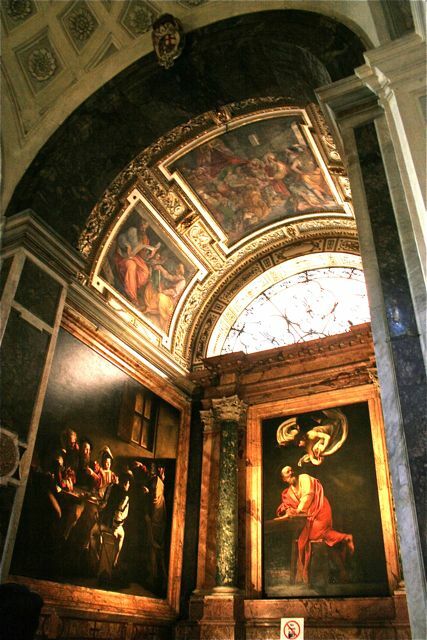 The Calling of St Matthew, by Caravaggio hangs in the San Luigi dei Francesi church in Rome. Having seen it in magazines and books for so many years and then to see it in all it's glory was truly wonderful. Caravaggio's use of light and drama is awe-inspiring. Three of his paintings sit together; The Calling of Saint Matthew is the one on the left. 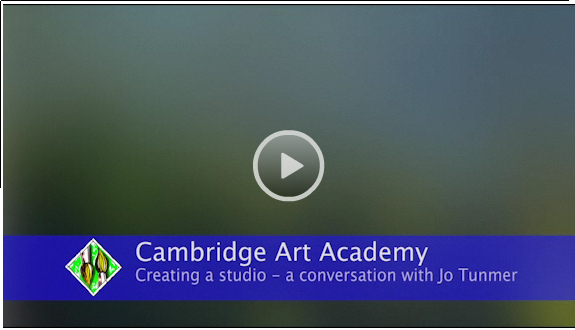 Here is the video of an interview of me done by Noel Garner, founder of Cambridge Art Academy, on the advantages of having one’s own dedicated studio. It’s an excellently put together production, and features some shots of my Open Studios private preview party. I prefer to be behind the camera so I hate seeing myself like this – but enjoy. Visit Noel’s website, too, since he is looking to turn these sort of interviews into a commercial venture. I have fourteen mounted original paintings available for purchase at Frameworks, Cottenham, Cambridgeshire. My gallery and studio are open during weekdays and some weekend hours until mid-August and then I re-open in September 2011. Please contact me if you would like a private viewing of my latest work. We had roughly 350 people through the doors during our only weekend opening for Cambridge Open Studios. Here are a few photos from the day and our private party on Saturday evening. David and Rosemary from So Mango performed for us which made it extra special.